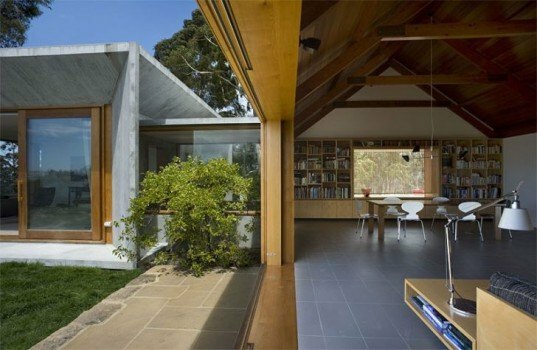 This striking addition to a home in Tasmania was recently awarded the Robin Boyd Award from the Australian Institute of Architects for Residential Architecture thanks to its smart use of the sun and rain. Angular in form and constructed of mostly concrete, the home addition uses solar passive design for heating in the winter and collects rainwater as well. Called the Trial Bay House addition and designed by James Jones of Architectus (previously of HBV Architects), the structure was inspired by the lens of a camera, and from the inside, artfully framed views are visible through the picture windows. The project involved a complete reorganization of an existing dwelling and the addition of a new living room, veranda, courtyard and garage. The beautiful home is located on Trial Bay and the most intriguing room is called the Channel Room, which overlooks D’Entrecasteaux Channel. Constructed out of precast concrete, the Channel Room is sturdy, robust and employs four windows – one for each facade. Each window acts as a camera lens and is adjusted to the subject, view and light. The existing part of the home has a traditional gable roof, of which the beautiful interior timber ceiling was retained. A large portion of the existing home was refinished with Celery Top Pine, a local Tasmanian hardwood. Double glazed sliding timber windows were added to encourage cross breezes and natural ventilation, while solar collectors and solar hot water heating were installed on the roof. Solar passive design helps warm the home when the sun is at low angles during the winter and rainwater is harvested for use on the property. Homes can save a ton of energy by employing the elements – like sun and rain – to do the work of heating and cooling, and watering plants. This home is a great example of passive design as well as of adding to and refurbishing an existing structure instead of building a completely new one. The project involved the complete reorganization of an existing dwelling and the addition of a new living room, veranda, courtyard and garage. The beautiful home is located on Trial Bay and the most intriguing room is called the Channel Room, which overlooks D'Entrecasteaux Channel. 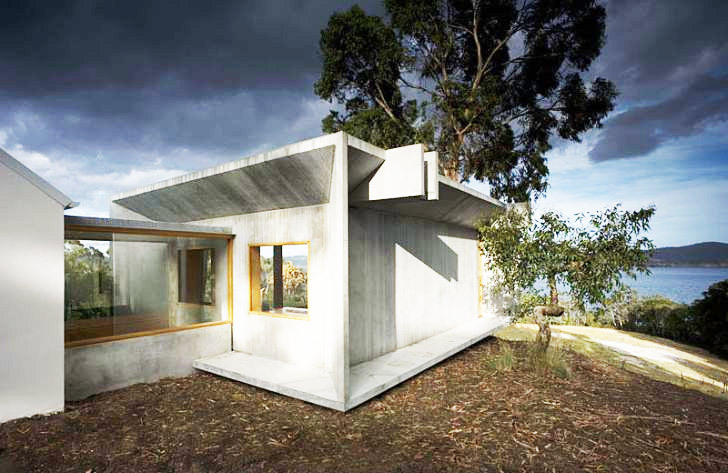 Constructed out of precast concrete, the Channel Room is sturdy, robust and employs four windows - one for each facade. Each window acts as a camera lens and is adjusted to the subject, view and light. The existing part of the home has a traditional gable roof, of which the beautiful interior timber ceiling was retained. A large portion of the existing home was refinished with Celery Top Pine, a local Tasmanian hardwood. Double glazed sliding timber windows were added to encourage cross breezes and natural ventilation, while solar collectors and solar hot water heating were installed on the roof. Solar passive design helps warm the home when the sun is at low angles during the winter and rainwater is harvested for use on the property. Picture windows in the Channel Room frame specific views. The interior is light-filled and warm. The interior of the main house has received a major overhaul as well, retaining only the timber roof. Here is the living room before the remodel. The site of the Channel Room with slab in place.